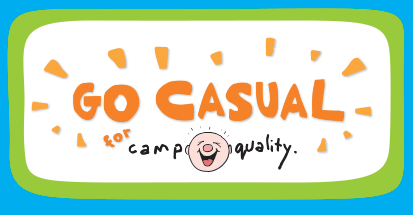 GO CASUAL FOR CAMP QUALITY is your opportunity to get together with your work colleagues or school mates on Wednesday 16 March by wearing your coolest casual threads to work or school. In it’s second year, we aim to raise funds via gold coin donation, which will all go towards supporting Territory kids and their families living with cancer. www.campqualityfundraising.org.au/event/casual . You can also ‘Like’ our local Facebook page to keep up to date with event info “Northern Territory Camp Quality”.